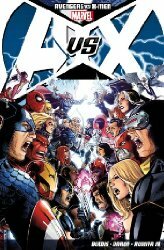 Incredible value for money, containing all thirteen issues of AVENGERS VS. X-MEN including #0. In X-MEN: THE DARK PHOENIX SAGA we witnessed the gentlest of souls, Jean Grey, corrupted by the limitless power of the Phoenix. No one and nothing could stop her. She ate a whole sun for breakfast and so destroyed an entire solar system, committing mass genocide in the process. It didnt end well, but it would have been worse if she hadnt stopped herself  if she hadnt committed suicide in front of her lover, Scott Summers. Now Scott Summers is in charge of an endangered species. During HOUSE OF M mutants were virtually wiped out in the blink of an eye, and its only since X-MEN: SECOND COMING that theres been any sign of blessed relief in the form of young Hope whose manifestation seems to have gradually triggered new mutants. Still, it has not been enough. Now the Phoenix force is heading back towards Earth, its target Hope herself. To a desperate, beleaguered and increasingly militarised Scott Summers AKA Cyclops this could be the key to kick-starting the mutant race, the one and only opportunity he may ever be offered, and though he has danced with the devil before he is determined to make it work. And it all. Goes horribly. Wrong. Oh, I just sent shivers up my very own spine. I wish they were merited, but honestly? Way too many cooks made for an unnecessarily stodgy broth. Apparently a major player died, but it took a customer to tell me because I couldnt even tell. I thought he was merely hungover. Or was that me? Also, while trying not to give a key development away, although arguments about the benefits brought by the Phoenix Force were well made, this wasnt Neil Gaimans MIRACLEMAN. However, however, I did like the Visions reaction to Wanda suddenly turning up at Avengers Mansion: instead of welcoming his wife back or even raging at her for his own destruction (see AVENGERS DISASSEMBLED, and you are encouraged to do so  magnificent and the very place to start reading the teams modern era!) he demands why, out of all potential strategies, she used his android body to attack his friends and destroy their home? Also, the best bit? Wolverine trudging across Antarctica wearing a polar bear, following a trail of beer-can breadcrumbs left by Hope so hed find her. Plus, it all made sense in terms of the trajectory of key characters  particularly Scott Summers  and the fall-out in the form of AVENGERS VS X-MEN: CONSEQUENCES written by Mr. Gillen gives us a credible and potentially thrilling new dynamic as seen now in Bendis ALL-NEW X-MEN. My favourite exchange may have been between Thor and a character possessed by the Phoenix Force.